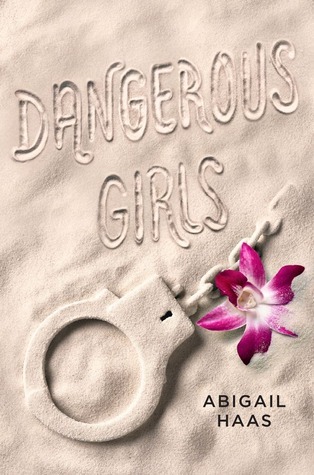 Dangerous Girls by Abigail Haas. Recommended For: People looking for a good, creepy, more mature YA mystery/thriller novel. Dispatcher: Miss? Are you there? Miss? Female 1: (sobbing) She's dead. There's a knife and... Oh God, I can't ... She's dead! This book started off with a BANG. Straight into the story in the most intriguing way possible. It ended with a bang as well. A group of teenagers go to an island to celebrate spring break. But one fine normal day? They find Elise dead in her room. Her best friend Anna is the leading suspect. Is she innocent? Or is she actually GUILTY?! I loved how the writing was paced. It kept alternating from BEFORE Elise's death, and AFTER (The trial and that stuff). It was quite awesome to read! I loved how it was a thriller too, since I haven't really read that many of YA thriller books. This was definitely in that genre though. Maybe not a 'omg I can't sleep: NIGHTMARE' kind of scary but it was honestly creepy. That slow chill you get after reading a shocking sentence or something 0.o Loved it mwahahahah!! I had noooo idea what this book was going to be like before I picked it up. I didn't even bother reading the synopsis and just plunged in blind after hearing one or two good opinions on it (my fav way heh). Awesomeness. Now I didn't really like the characters, to be honest.. They sucked. Weell maybe not sucked but they were those 'party all night and let's get stoned' kind of teenagers who are "free." Notice the quotations.. *cough* I don't think getting drunk and flirting and getting on with bunch of random dudes in bars count as free but meh. -.- It was like the group of perfect stereotypical rebel rich kids you see in TV shows. The relationships between the characters were okay.. I got really frustrated with some people at a few points but overall it wasn't too overbearing that I threw the ipad or anything.. Not that I would, because then the screen would go all kazoo (yes I know that's an instrument but I like making up my own meanings. *sticks out tongue*) and it costs too much to repair. That ending tho 0.o I did not expect that! You know I read a bunch of other reviews and they were all like "Oh yeahhh, I totally called that. It was just soooo predictable." Basically, If you want a refreshing YA novel, I am advising you to give this a try. Upcoming in my new personal sitcom 'Cassie Will Find Something Awesome For You (Eventually)', is The Giver! Stay tuned.